Some of the questions that pop up most frequently about web or video conference calling and online meetings are on this page. Our goal is to help you determine if our solutions are right for your organization. How quickly can I get a demo? How quickly can I get my account? Secure conference calling with excellent voice quality. Support for online meetings of up to 100 users. 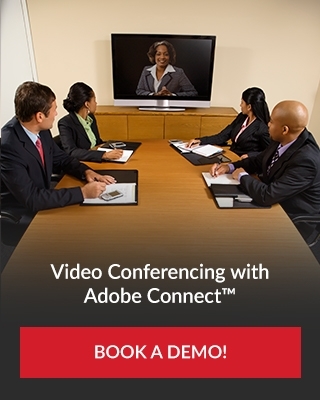 Award winning Adobe Connect™ is easily the fastest, most dynamic and most comprehensive web conferencing platform on the market. Third party reviews rate Adobe Connect™ as the best web conferencing available, higher than competitors WebEx and Citrix. Vesta Networks provides you with an Adobe Connect™ solution tailored to your needs. It gives your staff the power to collaborate easily and effectively from anywhere in the world, just as they would in a face-to-face meeting, but with more customized content at their fingertips. Why should I go with you rather than Adobe directly? The same reason you look to us instead of the big telecom companies, for unequaled support from real people looking to help your organization grow. Adobe Connect™ powers the dashboard, controls and tools you'll use to access the service management and to join meetings. Don't worry, The Vesta Difference is how we help make it easy. Can I use my landline or cellphone? Audio-only users can dial in using Toll Free numbers accessible nationally and in over 60+ countries internationally. How many users can connect to a single meeting? Up to 100 users can join a given meeting. We've not heard of a single client that's needed more. Can I share my desktop apps? Sharing your screen, apps and collaborating in real-time has never been easier. Have real working meetings again. Can I share from my tablet or smartphone? You can also join into the private chat, live whiteboarding and send live video. Is live whiteboarding supported on smartphone or tablet? Smartphones and tablets can join live whiteboarding to collaborate with your team. Can I setup recurring meetings with the same content? One of the best Adobe Connect™ features is the ability to save meeting rooms so you can resume right where you left off. Can I setup meetings after hours? Start a meeting anytime and with dial-ins from anywhere and a toll-free number for 60+ countries.